• 下面是一些基本资源： 1. 术语（专有名词） 2. Drupal Jargon. 首先, 通过点击桌面上的快捷方式,打开"Web-Developer Controller",.看左上角.你应该检查一下Apache 和MySQL是否在运行.如果是的话,那一切都准备好了.如果没有的话,选择Apache,接着点击"Start Service"按钮.等待,直到状态改变为"Running.".现在选择"MySQL"并启动它. 设置完重量以后，配置区块。你可以决定哪些人可以看到区块,以及区块展示在哪些页面.一个放置最新文章列表的最好的地方是首页.为了实现这一点,你需要找出要这些页面,选择"Show only on selected pages"选项,然后把你的页面输入到文本框中. 首先,必须启用contact(联系)模块.导航到Administer >> Site building >> Modules,从核心模块列表中找到contact模块.选中复选框,然后保存设置.导航到Administer >> Site building >> Contact form,在这里你需要设置分类—或者收件人名称[不要将这个与分类模块中的分类混淆了]. 表格的格式乱了,图片不能显示了,还有其它的一些奇怪的HTML问题---我觉得每个Drupal用户都会遇到过这样的问题. Drupal默认使用的是过虑了的HTML的;也就是说,只有特定的一些标签允许使用.还有,输入格式将一行很长的文本隔断了.解决的方法很容易:改用"Full HTML"输入格式.我将它设为管理员的默认选项.注意,对于这一输入格式,你可能还想加上URL Filter 和Code Filter;它们也不是默认的. 我不想让匿名用户看到"Create content"菜单---"Create content"通常是"Content"的子菜单项,而"Content"通常被禁用的.访问你的菜单管理页面,然后启用"Create Content"上面的"Content".这样你就可以看到一个"Reset"(重置)链接了.点击这个链接.这样, "Content"又被禁止了,这次,对于那些没有访问权限的人(特别是匿名用户)来说,他们就看不到"Create content"菜单项了. 我启用了Contact模块,但是当我作为一个匿名用户点击它的时候,我得到一个拒绝访问页面--- 你忘了一步.导航到Administer >> User management >> Access control页面,找到contact module部分,现在你可以为匿名用户赋予合适的权限了,(当然,登录用户也得设置). 我这个站点的首页是node #4,所以到首页的链接应该为这样: <a href="/node/4">Home</a>.如果启用了URL别名的话,我也可以这样: <a href="/home">Home</a>. 而"访问你的站点"页面的图片是通过下面的标签创建的: <img src="/files/pictures/Docs/WDP.jpg" align="right" hspace=1>. 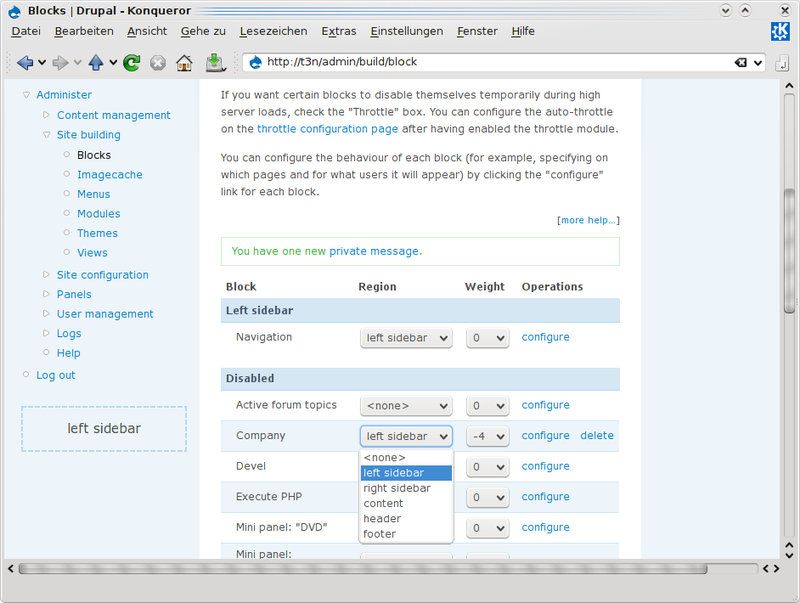 This version is not compatible with Drupal 7.x and should be replaced. Drupal界面文本，默认使用的是英文（比如“Log in”按钮，和"Add new comment"文本），但是这些界面文本可以翻译成中文。对于中文，简体和正体（繁体），都已经有了drupal内核的完整的汉化包，而对于第3方模块，部分已经汉化了，但是许多还没有汉化（如何使用这些汉化包，可参看本地化模块（locale module））. Vim(具有Linux/Unix 和Windows版本),有一个PO ftplugin插件,用来编辑GNU gettext PO文件. 你安装的PHP应该带有PEAR Archive_Tar包（这个需要zlib PHP扩展—为了检查你的PHP是否装了zlib扩展，你可以检查phpinfo页面的"zlib"部分）。这个需要提取Tar (在 l10n_localpacks 和l10n_drupalorg 模块中)和生成Tar(在l10n_community 模块中). 第3方模块中的可翻译字符串是独立的,没有包含到Drupal核心翻译模板中.模块作者可以到翻译模板提取器项目中下载potx-cli.php或者potx.module,用来生成他们自己的POT文件.提取器的使用指南可参看该项目的README.txt文件.生成的POT文件应该根据模块名来命名,不过这里使用.pot后缀,例如event.module的翻译模板为event-module.pot.这个文件应该放到translations(drupal6)子目录下面.而对应的翻译,也应该放在同一个目录下面.例如,现在event.module的translations子目录就包含了下面的文件: de.po, es.po, event-module.pot, he.po, hu.po. You must enable the Locale module to install Content translation. Would you like to continue with enabling the above? warning: mail() [function.mail]: Failed to connect to mailserver at "localhost" port 25, verify your "SMTP" and "smtp_port" setting in php.ini or use ini_set() in F:\xampp\htdocs\drupal-6.5\includes\mail.inc on line 193. Drupal的分类,很有特色,与许多CMS的分类方法都不一样,其原理我就不多讲了,drupal能够流行,除了它的钩子机制以外,还与它的分类机制有关.导航到” Administer>>Content management>>Taxonomy”(“管理>>内容管理>>分类”), admin/content/taxonomy,在分类页面,除了上面的说明介绍以外,在下面的词汇表vocabulary (又译作术语表)表格中还没有词汇表可用.让我们添加一个.点击”Add a vocabulary”链接,以添加一个词汇表.在词汇表名称字段中输入” drupal新闻”,在描述中输入” 关于drupal的国内新闻,国际新闻,安全公告”,在帮助文本中输入” drupal新闻的帮助文本” .内容类型,选择story,我们用它来发布新闻,因为新闻具有动态性,实时性.下面还有4个选项,tags,这个是自定义标签, Multiple select,是否允许选择多个术语, Required,是否是必须要选的,最后是重量,没啥用的东西.我们根据实际的需求,选中Required.这样在分类页面中就多了一个词汇表,让我们向其中添加术语,术语只有两个选项,术语名称和描述,其实下面还有一个高级选项,但是我从来没有用过.依次添加”drupal国内新闻”,”drupal国际新闻”,”drupal安全公告”. 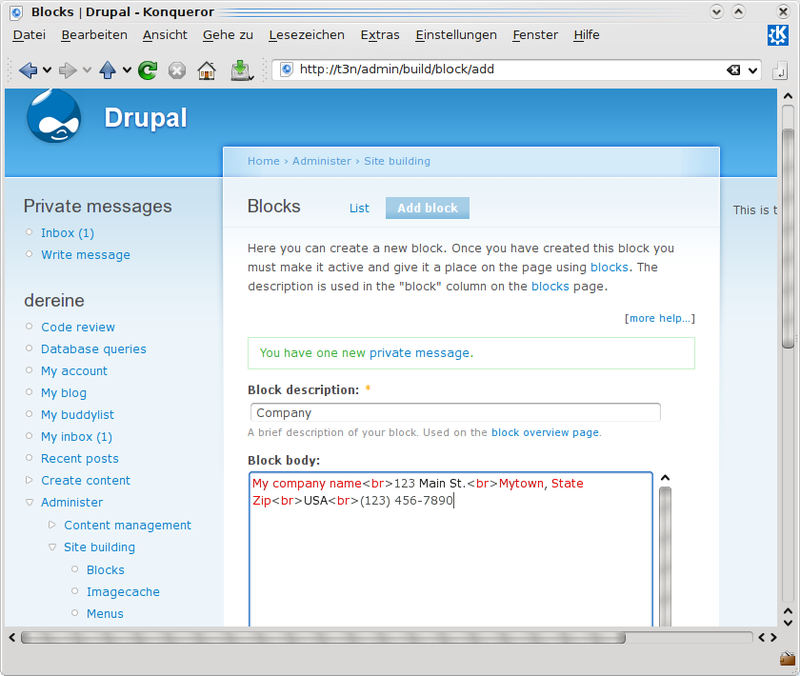 这里仅仅作为一个参看,也作为drupal CCK的一个入门教程,特别是定制节点模板的那部分,很少人会提到.你可以看看这篇文章Use CCK to make a unique front page,很早就有人提出了这种想法,而且不少人这样用,应该还是drupal圈内的高手吧, Lullabots的文章.还有这篇Take control of your Drupal front page layout using contemplate and CCK. Contemplate模块我没有用过,不过有不少介绍这方面的文章, joetsuihk 有篇文章Drupal cck contemplate theming 技巧, 教學,希望在你制作节点模板时,此文能给你带来一些帮助. 4,为了让postgresql开机就启动, 以root身份,在命令行中,输入chkconfig --level 345 postgresql on.也有图形界面的方式,用于启动/停止服务,但是我喜欢使用命令行. Acquia网络服务联系不到我.在邮件的下面,有相关的提示和解决办法,原来是我的cron出问题了.当然有问题了,因为没有配置阿.手工的运行一下cron.很快,又收到了Acquia Support的电子邮件, “We received a heartbeat from your site on October 14, 2008 at 12:20am, which means that the site is back online and able to communicate with the Acquia Network servers.”可以了,不过Acquia网络服务将自动的监督我的网站的运行情况,频率大概每小时一次.我的是本地的测试站点,没有站点url的,也没有人访问.所以这个就免了.